Whether you are finally getting around to remodeling your outdated bathroom or you’ve just purchased a fixer upper, you’re probably scouring the internet for ideas. Larger bathrooms are easier to design, as there is generally ample space that allows for the oversized vanity and ample storage solutions. But when it comes to smaller bathrooms, you have to be more conscious about the decisions you make about what to include in your bathroom. Everything down to the color of paint will have an impact on how big or small your bathroom feels. As an experienced general contractor Boone NC, we have seen a lot of bathroom remodels. Below are 7 tips to consider when tackling the small bathroom in your home. Light colors are essential, especially in a small bathroom space where there are many built-in features. Lighter colors will give the illusion that the space is open and bigger than it actually is, making it a little easier for you to breathe. According to many home improvements shows and experts, a double vanity is a popular option to include in a bathroom. This is a nice feature, but it isn’t always realistic for every space. When considering if you should install a double sink vanity or a single sink, consider how much useable counterspace you’ll have. Generally, people use counterspace more than the sink when getting ready, so having more space might be in your best interest. A medicine or similar style of cabinet is the perfect way to add additional storage without having large, built-in cabinetry. 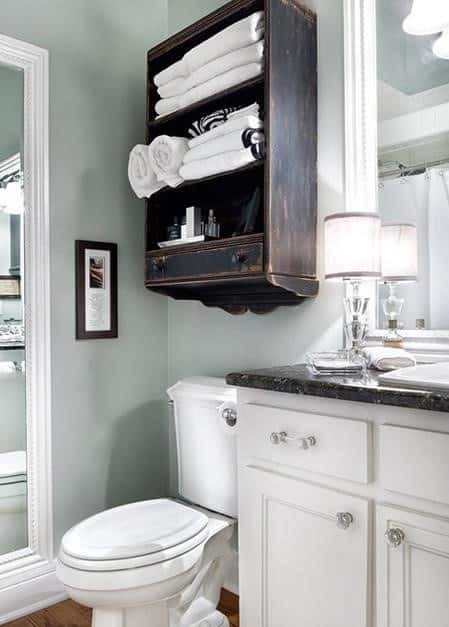 Utilize the space above the toilet with a medicine cabinet to store all the little things you need. A large mirror above your vanity is a great way to naturally “add” space to your bathroom. Mirrors reflect light, whether natural or artificial, which gives the illusion that your space is bigger. In your bathroom, you are going to need to have a place to store towels, spare toilet paper rolls, etc. Open storage is perfect for just such items! There is usually a spot for a shelf or two, where you can store these items for easy access. Additionally, moving things to open shelving will free up your cabinet space for all the bathroom essentials you don’t want on display. In a small space, horizontal divisions break up your space, making it appear even smaller. Taking your shower tile all the way to the ceiling will give the illusion that the ceiling is higher, while simultaneously drawing your attention away from how close the walls are. Don’t try to do too much in your small space, keep it simple. Stick to a basic color combination that is light and bright. Focus on quality and simplicity, which will help you to achieve a space that is elegant and spacious and not crowded and compact. If you are ready to take on a bathroom remodel contact Fairbanks Homebuilders, a general contractor Boone NC, to help you achieve the bathroom you need. Designing and achieving a bathroom that feels larger than it is, is possible with the assistance of Fairbanks Homebuilders!